Announcement Out of the Woods-USA speaks wood art in every form - wall art, sculptures, baskets, bowls, spoons, love spoons, music, math, science, sports, pyrography, scroll work, carvings, and yes, even paintings on wood. For more than 30 years, award winning wood artisan Bruce has been designing fine and decorative wood art and furniture for his family and friends. In 2009, his exclusive creations were made available to the public for the first time. Bruce specializes in a variety of artistic, decorative and functional wood art. Wood serves as Bruce's creative canvas and is a living medium of natural wonder and timeless beauty. Every piece you see is handcrafted personally by Bruce in his New Jersey studio using hand and / or power tools (not computer generated). Since duplicating machines are not used, each piece is one of a kind. Most home accent pieces and furniture in America are mass-produced. Reasons for this can be attributed to the need for consistency and affordability. Out of the Woods – USA fine, decorative and functional art pieces are valued for their unique design and the high caliber of artisanship. The pieces are made from a variety of domestic hard and soft woods such as ailanthus, ash, cherry, birch, elm, fir, hickory, locust, maple, oak, pine, sequoia, sycamore, walnut, and willow. Trees are never cleared for the wood; instead, trees that have been downed by storms, development, or by the utility companies are recycled and made into the beautiful creations you see. The majority of the wood is grown in rural and suburban New Jersey (unless otherwise noted). The art that is created with each tree suites the personality nature has given it. Bruce’s artwork is more desirable to buyers because his pieces start conversations, reinforce that you are special and unique, and connect on a more human and personal level. When you buy from Bruce, it’s not just a run-of-the-mill factory made home décor product you are purchasing, it’s an experience. Click on https://www.etsy.com/local/shop/OutOfTheWoodsUSA for a list of arts & crafts shows Out of the WoodsUSA will be exhibiting. Before purchasing, please take a moment to look at the size and description of the item you ordered and our policies. All our listings indicate the size and a thorough description. We strive for a five star review and do not want to disappoint by shipping an item that does not meet your expectations. Out of the Woods-USA speaks wood art in every form - wall art, sculptures, baskets, bowls, spoons, love spoons, music, math, science, sports, pyrography, scroll work, carvings, and yes, even paintings on wood. We currently only ship to the USA and Canada. Buyers from other countries, please send an Etsy convo to Out of the WoodsUSA. Depending on the item, country, and agreed upon postage and VAT, a purchase may be possible. Out of the WoodsUSA designs and creates decorative and functional wood art using recycled trees. Woodworking is Bruce’s passion. Each piece is a limited or one-of-a-kind item that is an asset for the discriminating buyer. Through art and craft shows and on-line sales, Out of the WoodsUSA maintains and attracts customers with exceptional quality and service. Bruce’s love for woodworking began during his elementary school shop classes. While attending PS #1 School in West New York New Jersey he was introduced to the tools of the trade in wood shop class. At the time of high school graduation, it seemed like the only people who were into woodworking and making handmade things were hippies – not someone who was looking for a career. Big box stores were rearing their ugly heads and most people were turning to them and shopping malls for their purchases. Instead of following his heart by pursuing a woodworking career, Bruce followed his head and attended and graduated from New Jersey Institute of Technology with a degree in Computer Science. After marrying Penny, a registered nurse, Bruce put his talent for working with wood and tools to good use by personally renovating multiple kitchens and bathrooms, installing doors, floors, walls, windows, staircases, etc. Soon, a son came along and all their spare time was spent with homework, scouting, soccer, baseball, basketball, music lessons, band, choir, etc. Marriage, home renovations, a child and work left little time for Bruce’s wood working hobby. In early 2009, Bruce was downsized from the cube farm. Ahhh he thought…I can finally follow my heart…I have the tools – all I need to do is set up a shop in my garage and start having fun! Bruce would make things and place them in a box to be stored in the garage. Before long, two cars could not fit in the garage…then not even one car could squeeze in. Penny started taking pictures of the pieces and kept encouraging Bruce to start selling his items at local art & craft shows. Bruce was not convinced his work was good enough to sell but the saws kept buzzing and pictures kept snapping. Every time people would come to their home, Penny would encourage Bruce to show off his work and each time people would reassure Bruce that his work was sellable. Finally, in late 2009 Bruce agreed to “try” a local art & craft show. Penny applied for a show and as they say, the rest is history. Bruce’s pieces were well received and people were buying his wood art. When Bruce was called back to work in the corporate world, he continued to work in his shop every chance he had. As time went on Bruce & Penny exhibited at more and more shows and each time they were asked about a web site. Through networking with other artists and crafters, Penny discovered Etsy and opened a shop. Once again in 2015, Bruce was downsized from the corporate world and now works full time in his shop. Through the years that ensued Bruce & Penny have joined forces. Together they exhibit at five to 10 art & craft shows every year. Bruce handles accounting and is the artist who creates the fine and decorative wood art in his home “studio” a.k.a. garage. Bruce specializes in a variety of artistic, decorative and functional wood art. He has improved on his natural abilities by reading countless books, viewing many videos, and by trial and error. Wood serves as Bruce's creative canvas and is a living medium of natural wonder and timeless beauty. Bruce uses hand and / or power tools to personally handcraft each piece. Welcome to Out of the WoodsUSA! 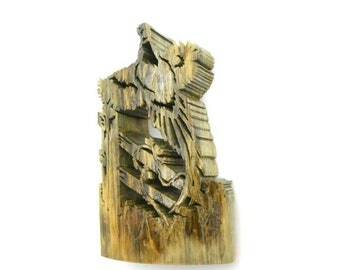 Thank you for visiting my handmade fine and decorative wood art gallery. Wood is my creative canvas and has timeless beauty. Please check back often, as we regularly add new pieces. I hope you find something here to love.